It seems that a woman’s love for couponing has gone too far, to the point that she has been reported stealing newspapers in order to collect coupons. She was not able to get away with it though, as the stolen newspapers eventually got her arrested. Jamie VanSicker is a resident from Arkansas and an extreme couponer as well. Like other coupon-clipping shoppers, VanSicker clips coupons from newspaper inserts. 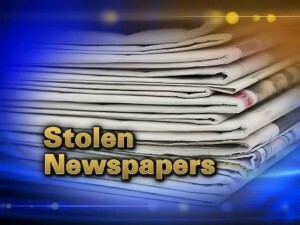 Recently however, police arrested VanSicker, saying she stole more than a hundred newspapers. Because no newspapers were returned, employees of the newspaper company assumed that all of them had been sold. Thinking that there was still a demand for the newspapers, the company continued to supply newspapers in order to get more sales. What the newspaper company did not know was that VanSicker kept taking the newspapers that were placed in the boxes. All of the incidents were caught on camera. According to the police, there was even one night where she collected a total of 62 newspapers. When the police finally contacted her, VanSicker had collected a total of 185 newspapers, which were worth $231 in total. According to Springdale’s Lt. Kevin Lewis, VanSicker said in her defense, that she was not aware that collecting unsold newspapers was considered a crime. According to her lawyer, VanSicker is embarrassed and shocked about what happened to her. Her lawyer also added that VanSicker feels disappointed with the newspaper company for going public with the incident and even filed charges against her.